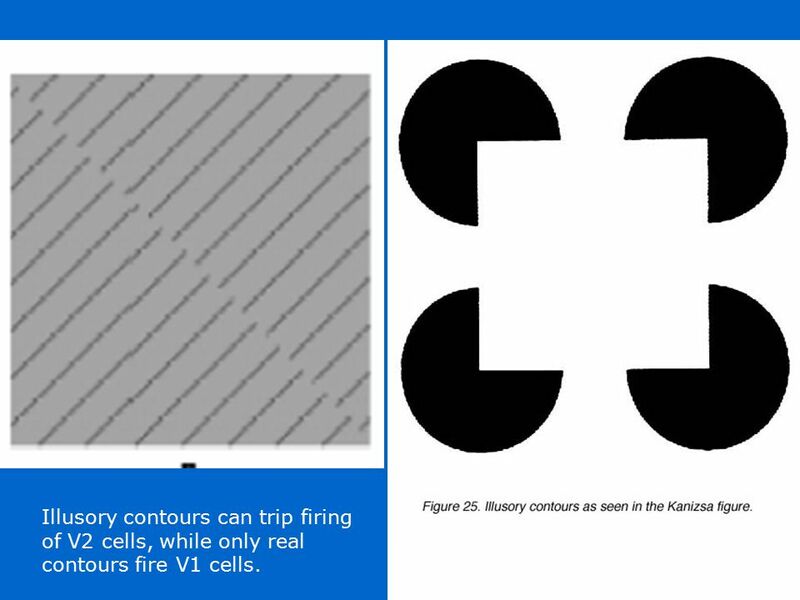 7 Illusory contours can trip firing of V2 cells, while only real contours fire V1 cells. 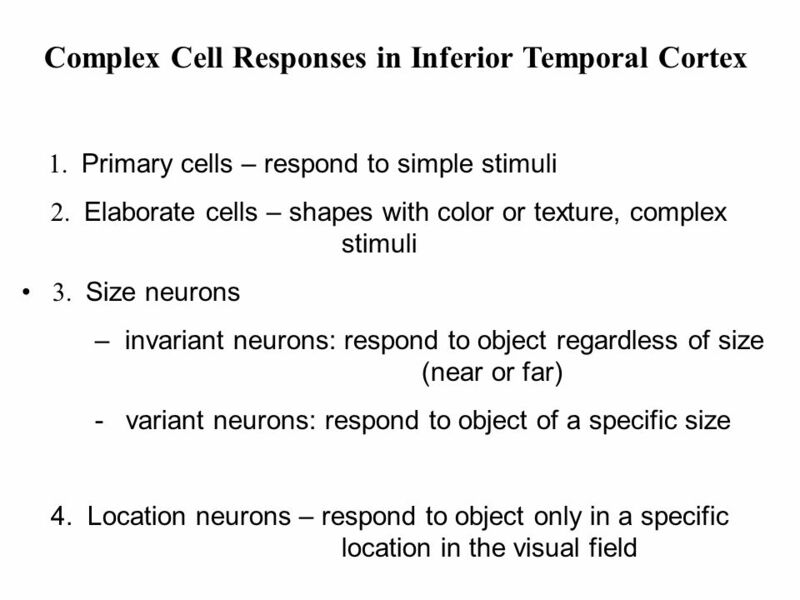 Direction-selective Cells – Cells responding to moving bar in one direction, but not in the opposite direction. 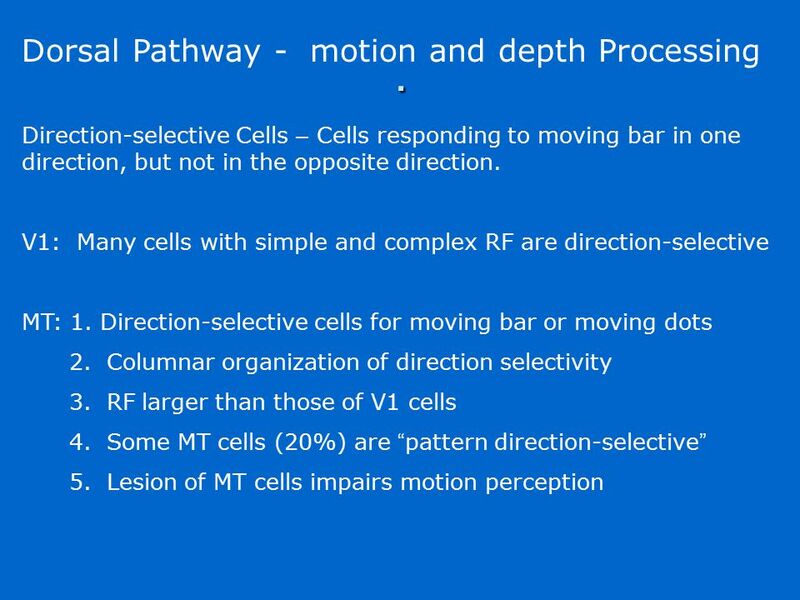 V1: Many cells with simple and complex RF are direction-selective MT: 1. Direction-selective cells for moving bar or moving dots 2. Columnar organization of direction selectivity 3. RF larger than those of V1 cells 4. 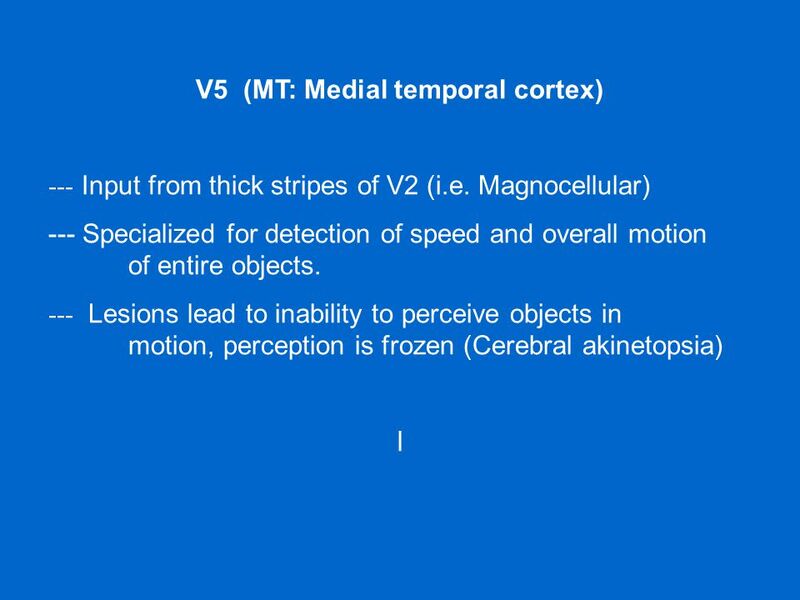 Some MT cells (20%) are “pattern direction-selective” 5. 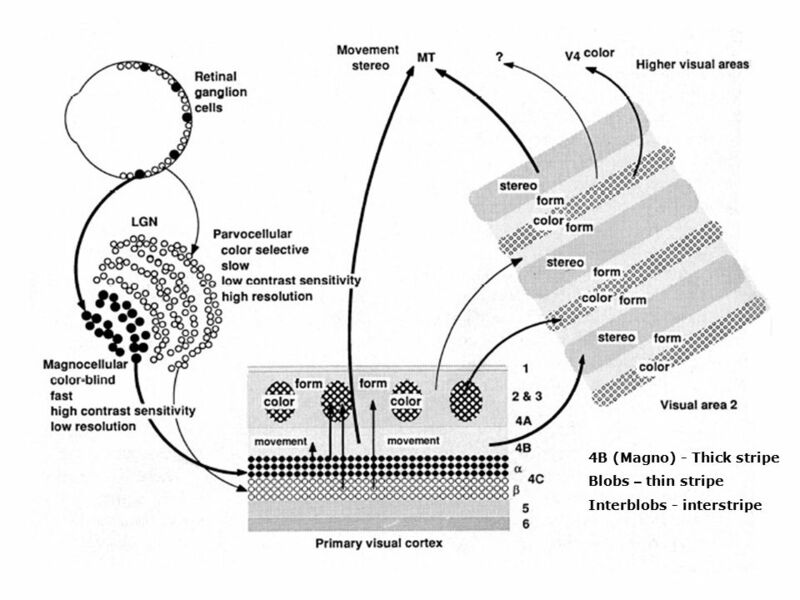 Lesion of MT cells impairs motion perception . 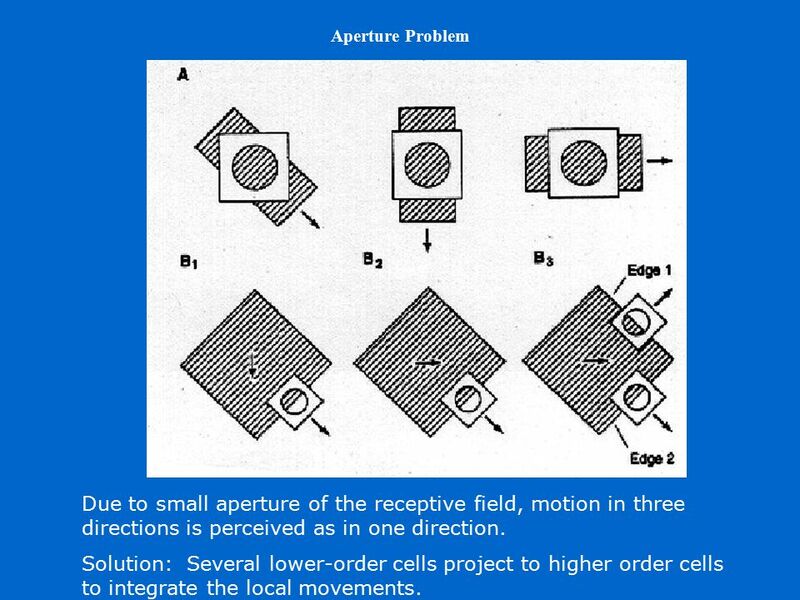 15 Aperture Problem Due to small aperture of the receptive field, motion in three directions is perceived as in one direction. 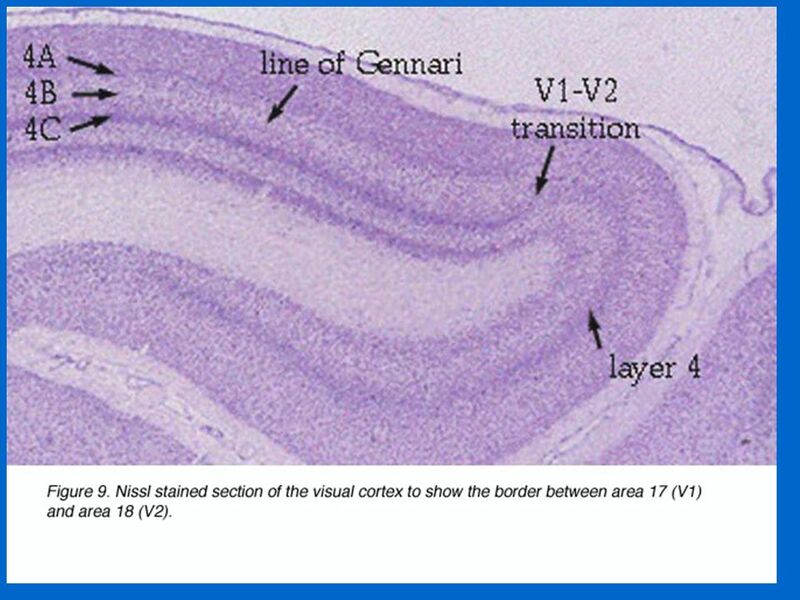 Solution: Several lower-order cells project to higher order cells to integrate the local movements. 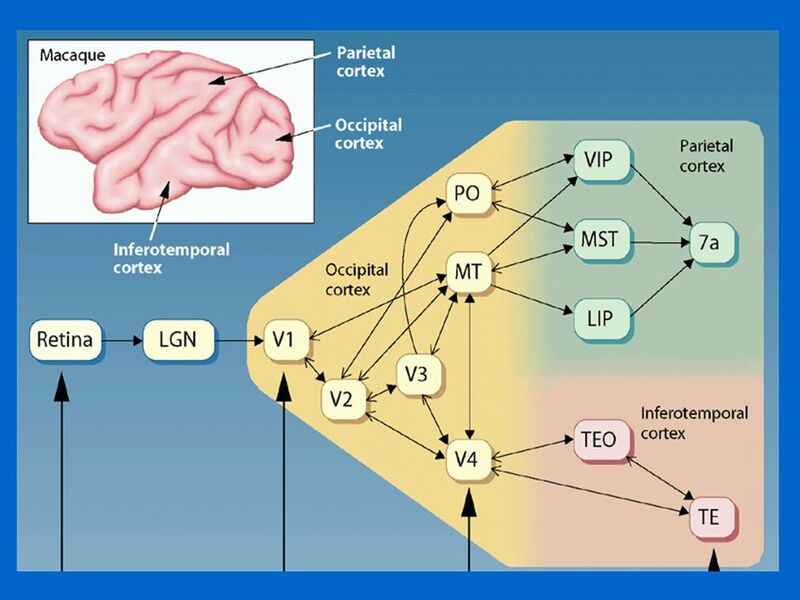 16 The binding problem: ----How the varied aspects of sensory information processed in different cortical areas are integrated to yield the coherent percepts and representations that we experience as the external world. 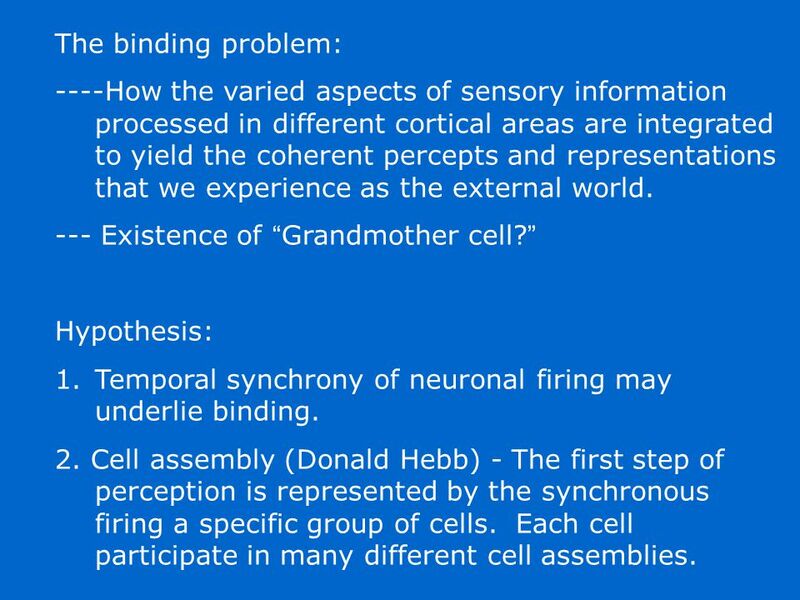 --- Existence of “Grandmother cell?” Hypothesis: Temporal synchrony of neuronal firing may underlie binding. 2. 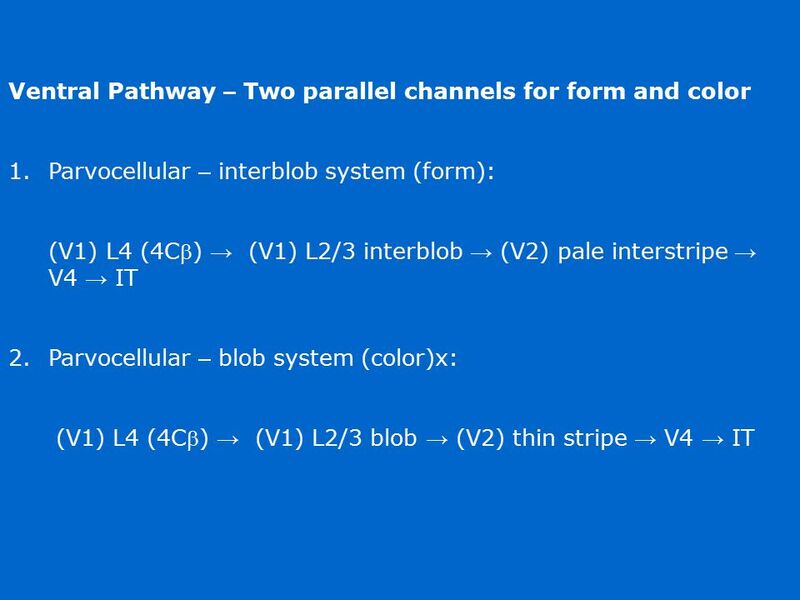 Cell assembly (Donald Hebb) - The first step of perception is represented by the synchronous firing a specific group of cells. Each cell participate in many different cell assemblies. 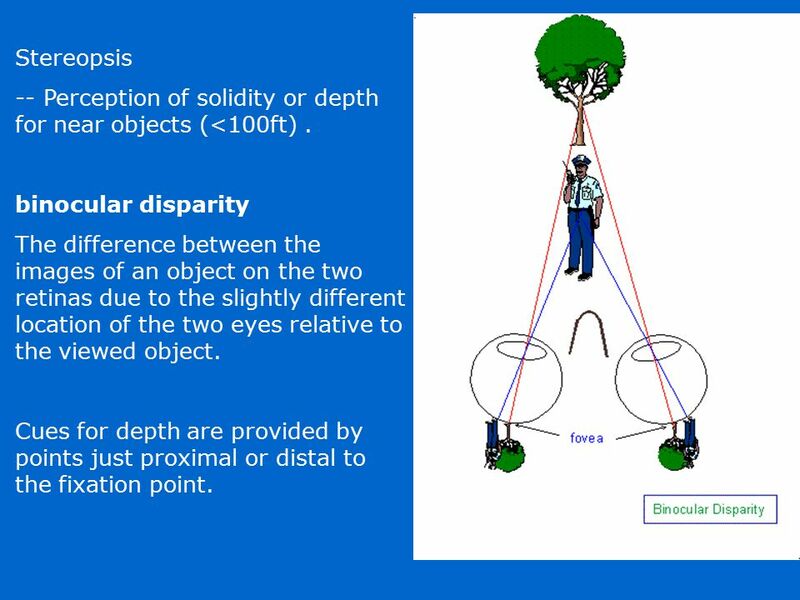 17 Stereopsis -- Perception of solidity or depth for near objects (<100ft) . binocular disparity The difference between the images of an object on the two retinas due to the slightly different location of the two eyes relative to the viewed object. Cues for depth are provided by points just proximal or distal to the fixation point. 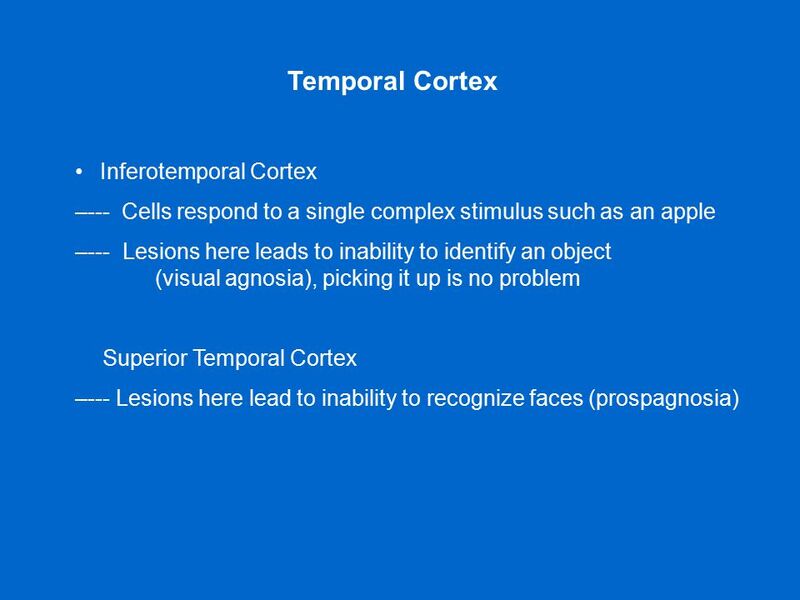 Download ppt "Higher Visual Areas Anatomy of higher visual areas"
LGN & CORTEX © Wesner, M. F..
1 Motor Control Chris Rorden Ataxia Apraxia Motor Neurons Coordination and Timing. 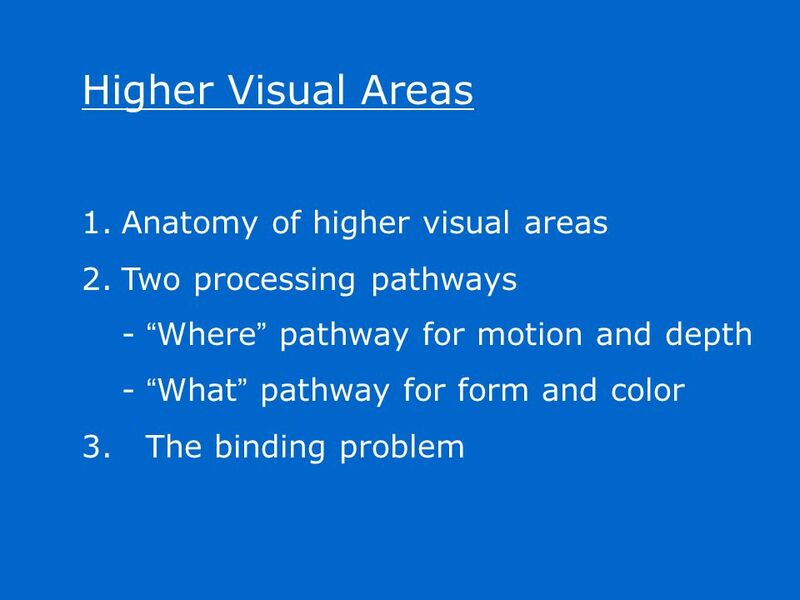 The Visual System: Color Vision Lesson 18. 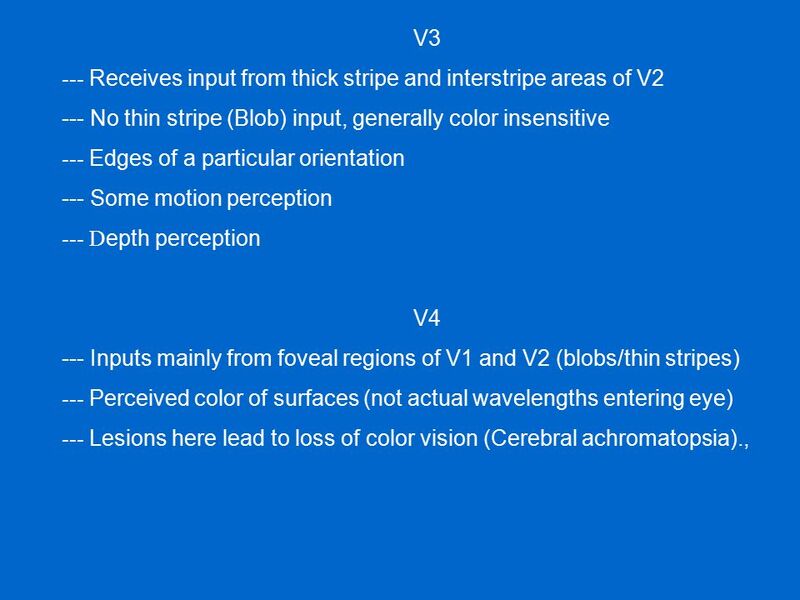 The Trichromatic Theory n Young-Helmholtz (1802) n 3 types of color receptors l Cones n Differential sensitivity. 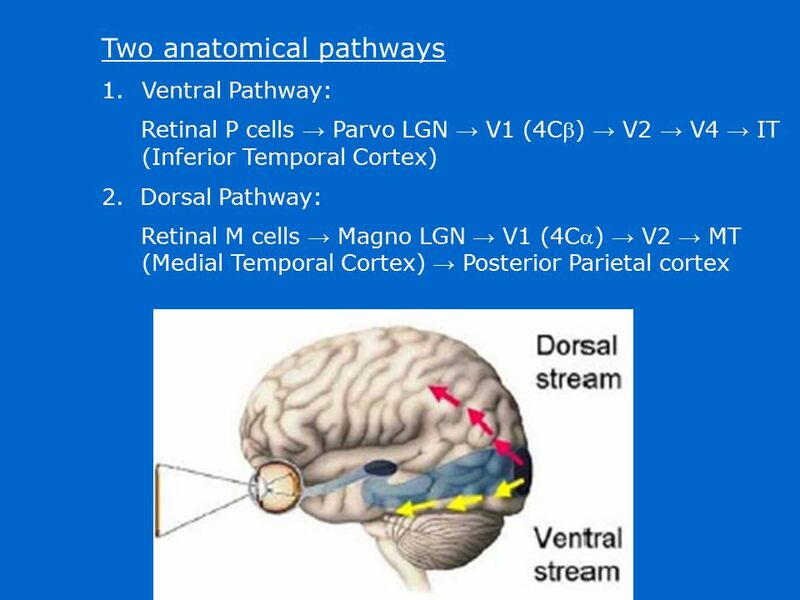 Anatomy/Physiology of Binocular Vision Goals –Follow the M and P pathway out of primary visual cortex –Answer where binocularly and disparity driven cells. 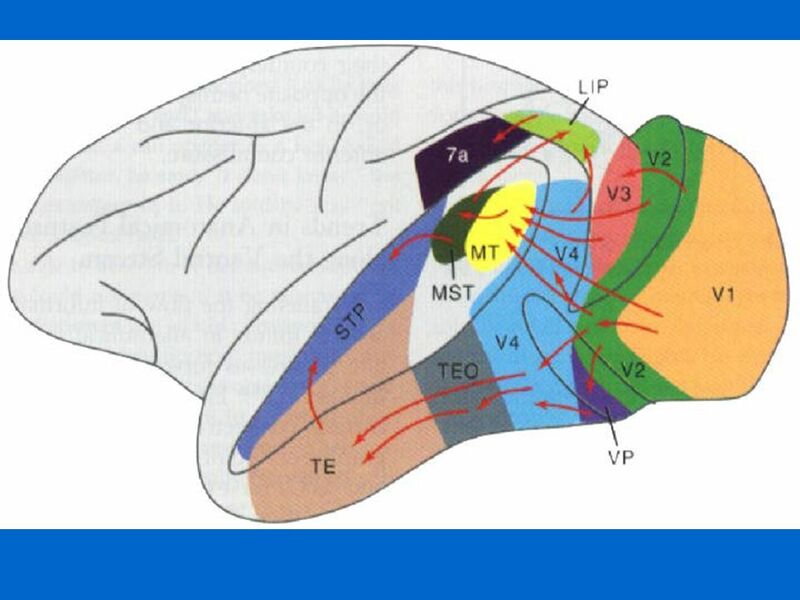 Visual Fields KW Fovea on Cortex KW 8-22 Occipital Lobes are Independent KW 8-24. 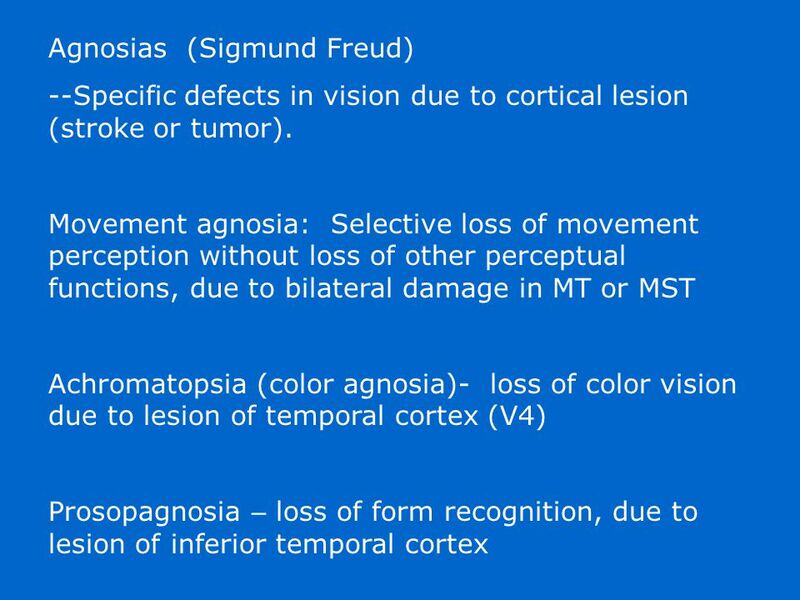 Evidence from Lesions: Agnosia Lesions (especially in the left hemisphere) of the inferior temporal cortex lead to disorders of memory for people and things. You have a test next week!